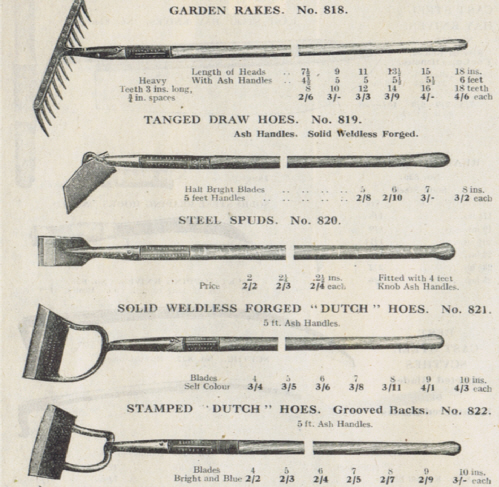 One element that appears when researching vintage garden equipment is the names associated with that particular item. These names may be of the designer, manufacturer, importer, company owner, it may even be a name on a long-forgotten patent. Sometimes with larger items like garden tractors, rotavators or mowers we also get to know the name of the original owner, that specific individual name; perhaps it was a family member or a sales receipt exists being passed along with the machine to each new owner. But with small pieces of equipment such as hand tools these individuals names, apart from the manufacturer, remain a complete mystery, there’s no receipt, no trace and often no family link, these tools are the incidental items in a shed, the items with a hidden history. The long lost forgotten name might be the original owner who spent several evenings looking through catalogues, perhaps visiting the local ironmonger to weigh up the pros and cons and different makes as well as the price in pounds, shillings and pence. 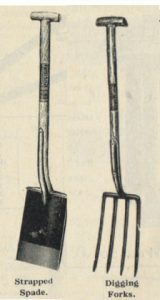 It might be the head gardener of a big house who chose a new Neverbend spade and the decades of unknown gardeners afterwards that continued using it, cleaning it and wiping it down with an oily rag after use. Who were these original owners and users of all these tools? Probably we will never know…..
…..Until, a few years ago I received a document dated 1930 about a struggling 27 year old garden labourer (I’ll spare his name) who lived just outside Moffat, Scotland. As I look out of my Yorkshire window at the freezing December rain in 2018 it reminds me how much these gardeners of past would both care for and rely upon their basic garden tools all year around even in the depths of winter, these same tools that we see in collections today which must have a story to tell. Not forgetting the physical labour involved in their use. It’s perhaps worth remembering that there could be a fascinating history behind every collection of hand tools, secateurs, shears or the everyday garden items that many hands have used. If only they could tell us. 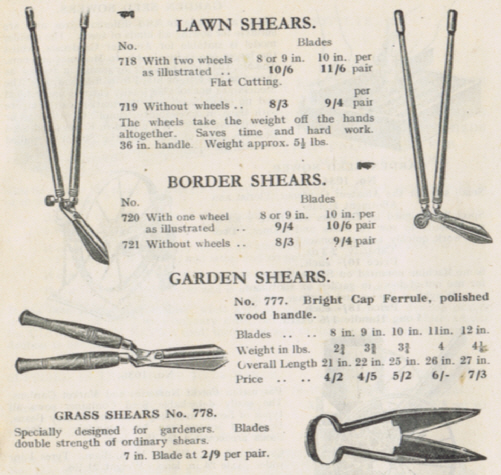 Perhaps some of these 1930’s gardeners tools from Moffat are still in use today…or even on a vintage display somewhere?